This section is an important section for buyers and sellers alike. Knowing what to look out for can avoid disappointment and upset when buying or selling sugar tongs. Sugar tongs are delicate and over the years can have had some rough treatment. In 200 years of use, it is hardly surprising that they got broken. 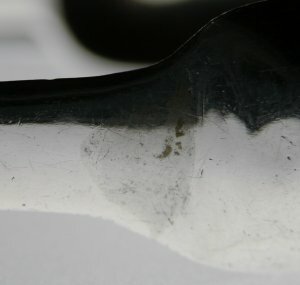 In fact a large percentage of Georgian silver sugar tongs have actually ended up as scrap, to be melted down and used again. This is particularly true of sugar tongs as, up until recently, they were seen to be of little intrinsic value. This meant that they were very quickly judged to be damaged “beyond repair”. Even today, dealers will more often than not send a pair of damaged sugar tongs for scrap once they are broken. There are many different views regarding the effect of damage or repairs on value. In truth the only view that really matters is your own. A repair need not necessarily matter and these days it is quite common for collectors to largely ignore repairs, especially if well done and the item in question is desirable. 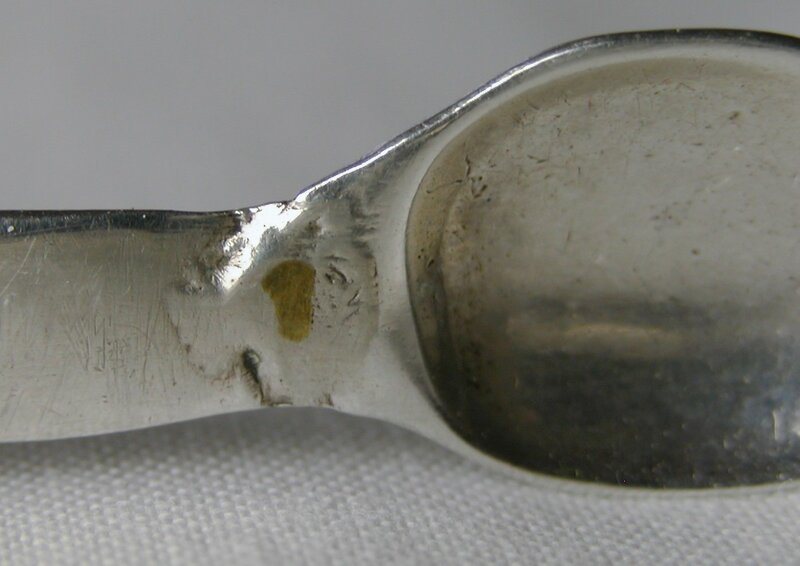 Stress fractures - Sometimes the original striking of a hallmark or maker’s mark will cause a stress fracture, (particularly prevalent if they were marked in the bowls which is perhaps why this practise did not last very long). These are not usually serious and are an integral part of the history of the tongs. Personally I would ignore this and not consider it affecting the value at all. Missing or rubbed maker's marks - sugar tongs can sometimes have some part of the marks missing. This can easily happen through years of polishing or if the mark was not struck well at the time of manufacture. Often the mark is only partly rubbed. This can make it difficult to identify the maker, but not necessarily impossible because some maker’s marks are so distinctive that they can be readily identified even if only a small part of the mark remains. The lack of a maker’s mark is not necessarily important especially if they are a particularly interesting pair of tongs. The other marks can also be rubbed or badly struck. This is not a problem on its own, unless there are other parts of the marks also missing. The Lion Passant is the mark that indicates that the tongs have been Assayed. It is the sign that the quality of the silver has been tested and found to be pure, (92.5% silver) and is therefore important as a “quality” mark. Occasionally not all of the Lion Passant can be seen. This does not matter provided that sufficient is visible to be able to determine that the tongs are genuine. The shape of the tongs. Sugar tongs will often be slightly bent, out of shape or have kinks in the arms. These are not serious problems but do detract a little from the beauty of the item. These are easily straightened by a reputable silversmith if necessary. My personal preference is to leave them as they are & not to be too concerned. After all they show years of usage which is part of the history of the item. Often the bowls will be damaged. There could be a small crack, dents, or the edges may be damaged. Again these small flaws will not be serious but will detract a little from the overall quality. 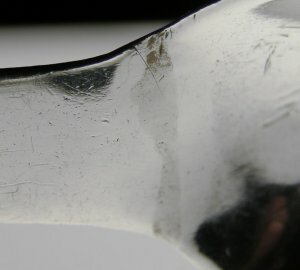 The most common form of damage to be seen on sugar tongs is a split in the centre of the bow (or "spring" as the silver-smith would call it). This comes about from many, many years of compressing the bow to use the tongs. Often this has been repaired - see below. Repairs come in many places on sugar tongs. It is amazing how many different ways in which a pair of sugar tongs can suffer damage - and have that damage repaired! 2. It is very rare for these tongs to be completely unscathed. Provided the repair was well done and difficult to detect, then it need not necessarily be a problem. The casting process is imperfect anyway, so a carefully done repair would not make very much difference to the aesthetic quality of the tongs. Often with cast tongs one of the links will be broken. This could have been touched up with a light piece of solder & be quite difficult to detect. The worst repairs on cast tongs are the inserted plates - especially where these have not been well worked to blend in with the surroundings. As indicated earlier, the bow is the most susceptible to damage and therefore the most often subject to a repair. Repairs to a split bow can be of a variety of qualities. I have shown a few below, some are plate repairs, some solder. The key point to remember is that with a very close look, these repairs can always be detected. A repair to the bow. 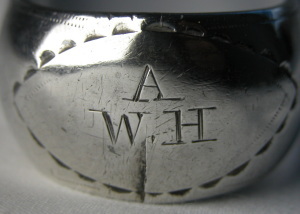 Notice the faint discoloured line in the centre, partly disguised by the fact that the monogram is partially worn away. A close look will also show that the engraved edging is not complete, partly "broken" both top and bottom. a solder repair seen from underneath the bow - easy to detect. a plate repair under the bow of a pair of Irish tongs. This time the silver-smith has not been too careful & inserted the plate right across the middle of the hallmark! Sometimes the tongs will break at the tops of the arms. Again these might be repaired with either a plate or soldered. a plate repair to the top of one arm. This has not been very well smoothed, making it obvious. Also, the silver-smith has placed the repair over the top of the hallmark so only half of the mark can be seen. a solder repair to the top of the arm. The solder is a different colour to the rest of the silver making it easy to detect. This is not always the case. a solder repair that is quite difficult to detect. The dead giveaway is the break in the pattern on the outside of the arm. There is also a slightly discoloured wavy vertical line that can be seen. The bowls can be very susceptible to damage and are often repaired, either at the junction of where the bowl joins the arm or inside the bowl itself. this is an interesting repair as the silver-smith has used both a plate and solder. There is a plate across the outside of the bowl and the damage on the inside has also been soldered. this bowl has been soldered back onto the arm. 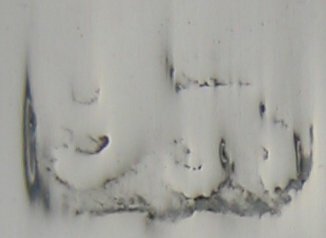 The discolouration gives it away, as does the vertical straight line. This is the most common type of repair to be seen to bowls. The subject of "short" tongs is controversial and it is often unclear whether the "shortening" was done at the time of manufacture or later. With short tongs, you can almost always see a line where the bowl is joined to the arms. Whether this was done after, to remove a part of the arms that was damaged, or at the time they were made is subject to lots of discussion. The pair below is a good case in point. the vertical line on both the bowls is a very clear indication they were soldered onto the arms. A very close look at the sideways picture also reveals a diagonal line that shows the way the bowl was "laid" onto the arm and soldered on - very clever. This is not intended as an exhaustive description of all the damage and repairs that you will see, but aims to show the most common things you will come across. Remember, these repairs do not always matter. Even the most damaged or poorly repaired pair of tongs may be valuable (if rare) or important to the collector as an example of a particular style, period or maker. The best way to have information about Georgian Silver Sugar Tongs always at your finger-tips is to buy the book. It is available from this web-site, simply click the picture!